Tuhiata, known as Tuhi, was hanged in Wellington for the murder of the artist Mary Dobie at Te Namu Bay, Ōpunake. Tuhi wrote to the governor days before his execution asking that ‘my bad companions, your children, beer, rum and other spirits die with me’. Mary Dobie was a gifted artist who produced many sketches of New Zealand scenery for the London Graphic, a magazine owned and edited by her uncle. 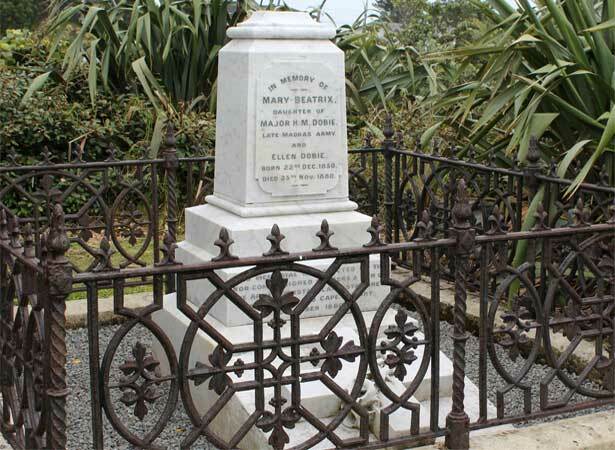 She was murdered while visiting family at Ōpunake on 25 November 1880. She had walked to Te Namu Bay to sketch Mt Egmont/Taranaki for the Graphic. When she failed to return that evening, a search party was organised and around 9.30 p.m. her body was found. Initial suspicion rested on Walter Stannard, a horse-breaker from Hāwera who had been seen in Ōpunake on the day of the killing with blood on his clothes. He was also one of the last people to see Mary alive when they passed on the road. A depositions hearing cleared him of the crime when it was proved that the blood had come from his horse’s bleeding nose. At the conclusion of Stannard’s hearing Tuhi, who was already in custody, confessed to the crime. Evidence had been presented that his clothing was bloodstained and witnesses said he had told them of his guilt. Tuhi claimed that he had followed Mary Dobie without any intention of killing her. She became frightened and, thinking he was going to rob her, gave him what little money she had on her in an attempt to get him to leave. When she warned Tuhi that she would ‘tell the soldiers’ about him, he panicked. After trying to strangle Dobie, he stabbed her in the throat as she attempted to run away. The killing of a Pākehā woman by a Māori outraged the settler community. The apparent lack of motive also concerned many. The judge in his summing-up told the jury that this was irrelevant if they were certain that Tuhi had killed Dobie. The plea that alcohol had been responsible for a ‘sudden maniacal act’ was supported by only one witness and in any event was no defence. The jury returned a guilty verdict in less than half an hour and Tuhi was immediately sentenced to death. The hanging was to take place on 29 December at Wellington’s Terrace Gaol. I have heard that I am to be put to death on Wednesday, and I am willing to die on that day, but I have a word to say to you. Let my bad companions, your children, beer, rum and other spirits die with me. Let these persons, beer, rum, and other spirits die with me; they led us to commit wrong, and now let us die together. We have 3 biographies, 5 articles, related to Tuhiata hanged for murder of Mary Dobie.